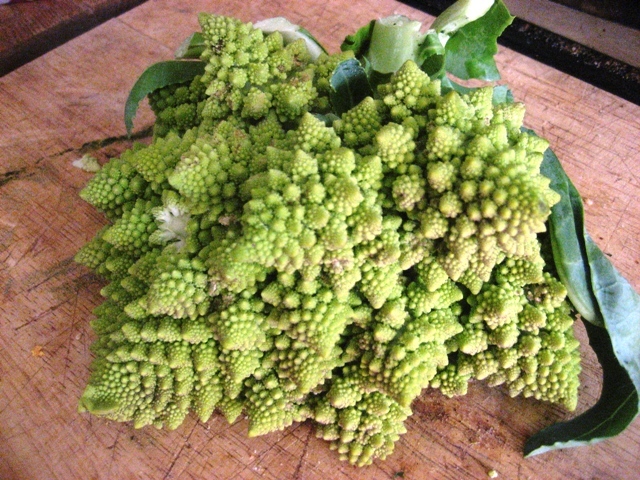 Romanesco, the cruciferous family's model vegetable! 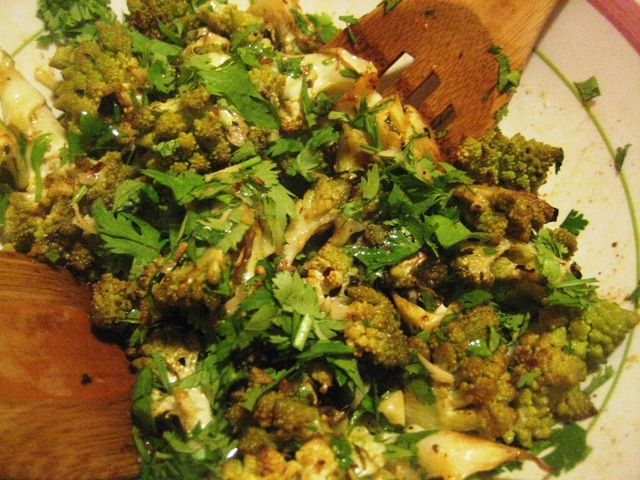 Romanesco is similar to broccoli and cauliflower and so you can substitute either of those vegetables in this recipe. Dana and I have a lot of romanesco growing in our gardens and will be selling some to local restaurants in the coming weeks. This very cool looking plant was first discovered in Italy in the 16th century. It has a mild flavor similar to cauliflower but it certainly sets itself apart from the rest of the cruciferous veggies with its’ chartreuse coloring and cool growth pattern that makes a logarithmic spiral. 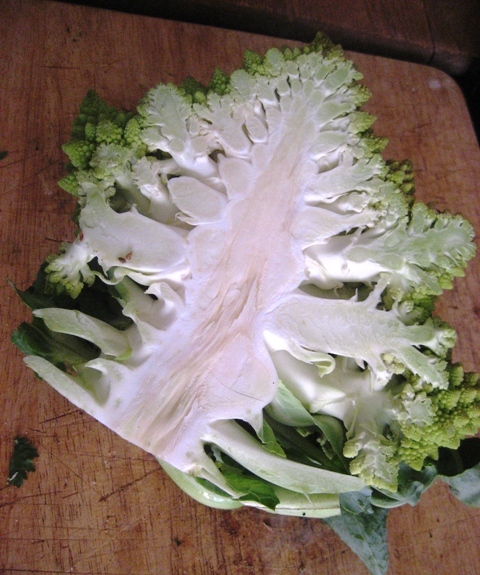 A head of romanesco chopped in half. You can see the individual branches that make up the spiral head. For this easy roasted meal you’ll need a head of romanesco or cauliflower, chopped into 2-3 inch pieces. Set your oven to 365. 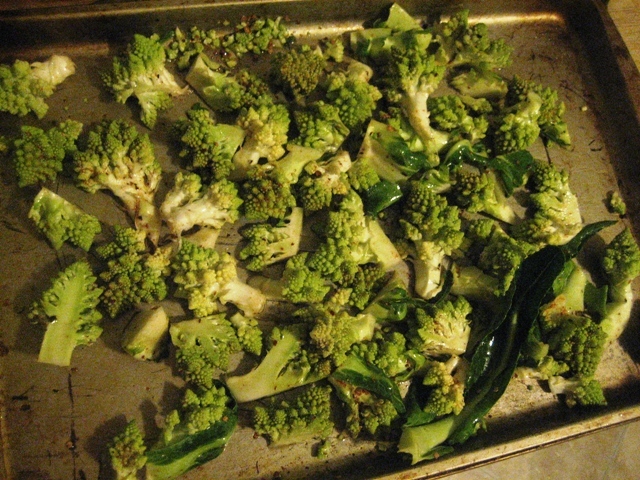 Then, on a large, shallow baking sheet, mix the chopped romanesco pieces with enough olive oil to coat, 1 tablespoon of lime juice, hot paprika, ground chipotle pepper and salt, to taste. Use your hands to mix everything together. Make sure to lick your fingers when you are done mixing, if it tastes good, pop the tray in the oven. If not, adjust the seasonings and repeat! Oven ready: well oiled, seasoned and tossed. While the Romanesco roasts in the oven at 365, roughly chop a handful of fresh cilantro. Grate some cheese, I used smoked Grafton cheddar from the Berkshire Co-op, the smokey cheese went perfectly with the hot smokey chipotle and the paprika. The Romanesco can take anywhere from 20-35 minutes, so cook it til it’s done and finish it under the broiler if it needs more browning but not much more cooking. You want it to be browned on the outside but with a bit of crunch left inside. The addition of shredded smoked cheddar really makes the dish! Finally, toss the finished romanesco with the chopped cilantro, a splash of fresh lime, and the shredded cheese. Eat immediately and enjoy any leftovers hot or cold the next day. That sounds awesome, will have to try this weekend. Thanks so much.